Anthony Ervin is a four-time Olympic medalist, claiming the title of fastest person on the planet both in 2000, as well as 16 years later when he won the Olympic title in the 50-meter freestyle at the Rio 2016 Games. After winning the Olympic gold, two World Championships, and seven NCAA titles, Anthony retired at the young age of 22 in 2003. Ervin then spent several years traveling the world and exploring other interests including his higher education, music, tattoos, teaching people all over the world about swimming, and tsunami flood relief. His vision is to use his experiences and his platform as a chance to give back and inspire people of all ages to live the life they love. His return to the swimming world has already caught the attention of major media outlets including Sports Illustrated, Rolling Stone, The Guardian, The New York Times, and CNN. In December 2011 at his first USA swim meet in seven years, he won gold at the Chesapeake Pro-Am and immediately put himself back in the US top five. Anthony participated in the US Olympic Trials and was selected for the London Olympic Games for the 50-meter freestyle. Following the Olympics, Anthony swam to 16 medals on the World Cup circuit – nine of them gold – and an American record in the 50-meter freestyle. In 2014, Anthony regained his US national title in the 50-meter freestyle, snagging a silver medal at that year’s Pan Pacific Championships in Australia. His return at 30 brings a renewed outlook of enjoying the journey and appreciating the moment. His memoir, Chasing Water: Elegy of an Olympian, was co-authored with Constantine Markides and released via Akashic in 2016. Anthony’s story is especially unique in that his family tree represents a broad demographic of Jewish and African-American descent, truly embodying the diversity of our modern world. Over the years Anthony has grown to embrace his place in the world as an opportunity to reach out and try to give back. He auctioned off his 2000 gold medal on eBay and donated the funds to tsunami relief in Southeast Asia. He was also the spokesperson for the International Water Safety Day that reached over a quarter-million people last spring. This inaugural Water Safety Day partnered with US Rowing, the Boys and Girls Clubs of America, and USA Swimming member clubs nationwide. Anthony proudly represents FINIS swimming and apparel and is currently training under US Olympic Head Women’s Coach, David Marsh. 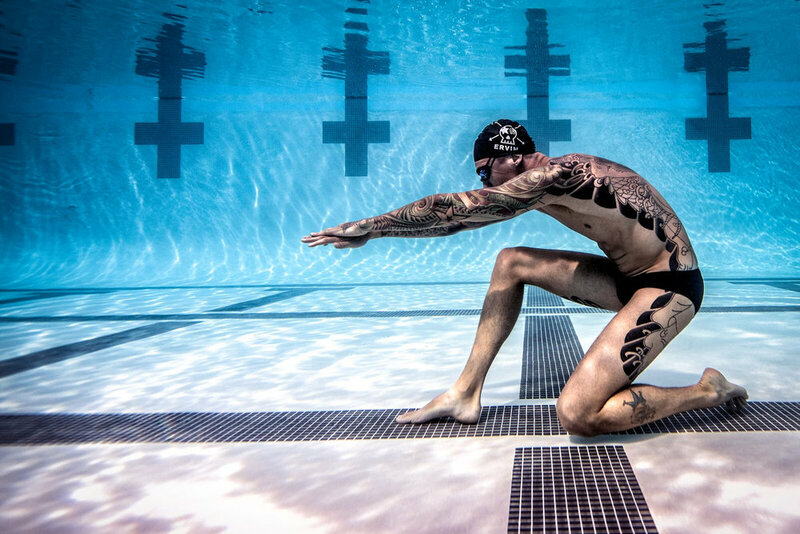 Anthony Ervin is the fastest human in water. Ervin struck gold at the Rio Olympics, making history by reclaiming the Olympic title he first won as a teenager 16 years prior at the 2000 Sydney Games. After his win in Sydney, Ervin retired from the sport to find himself, setting off on a journey that was part spiritual quest, part self-destructive bender, involving Zen temples, motorcycles, tattoo parlors, and rock ‘n’ roll. Through this journey, Ervin explored a slew of identity labels that had plied his entire career: African-American yet passes for White, Jewish yet celebrates Christmas, the diagnosis of Tourette Syndrome, and the “rebel Olympian” image bolstered by auctioning off his 2000 gold medal to donate the proceeds to 2004 tsunami relief. In 2012, after being away from the sport for over a decade, Ervin resurfaced to make not only the U.S. Olympic team but to swim faster than ever before. In Rio, his circuitous comeback was complete: the oldest swimmer to win a gold in any individual race, he once again earned the title of fastest swimmer on the planet. Ervin speaks on his life’s journey, starting at hitting bottom after he won gold, only to find his way to the top of the world once again.